I received this publication from Valerie Chapman-Stockwell of Central Washington University. ELLENSBURG, Wash. — Central Washington University is one of a very small number of universities in the nation to offer an academic program about beer. The Craft Beer Trade Certificate is open to individuals 21 years or older who are interested in craft beer brewing and the craft beer industry. Launched in 2010, the goal of the program is to prepare students for careers in this important and growing Washington industry. Craft beer is an important part of Washington’s economy. The state has more than 120 breweries, ranking second in the nation only to California in that category. Overall, the brewing industry is responsible for about 100,000 jobs in the United States. That means CWU’s certificate program produces highly sought-after graduates. With an advisory board of industry professionals from companies such as Hop Union, Northwest Brewing News, Hale’s Ales, Diamond Knot, and other well-known Washington breweries, the program is geared toward industry needs. The board provides important feedback and direction to CWU faculty, ensuring that the program stays current and provides students with skills and knowledge that the industry is looking for. Along with math and chemistry prerequisites, students in the certificate program must complete four courses (16 credits) to receive the certificate: Brewing Microbiology, Principles of Malting and Brewing, Merchandising Management for Micro Brewing, and Brew Process Technology. The program includes lectures, laboratory work, field trips, industry speakers, brewing, and tasting components. Most students can expect to complete the program in less than a year, graduating with a well-rounded knowledge of brewing and the craft beer industry. Last year’s program graduates are already working in the industry, and the second wave will graduate this spring. 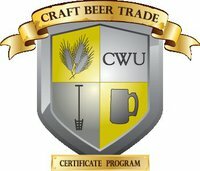 The Craft Beer Trade Certificate program is a collaboration of CWU’s Office of Continuing Education and the departments of Biology, Industrial & Engineering Technologies, and Information Technology and Administrative Management. For more information visit http://www.cwuce.org/beer_education or e-mail pangrazi@cwu.edu.